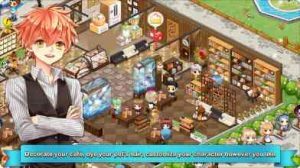 manage your café and upgrade your village! Adopt pets like Welsh Corgi puppies, American short-hair cats and lob eared rabbits! They will go on errands for you, and perform tricks to take special orders from customers! Take care of your pets, dye your pets’ hair, go on walks together, and explore together! Make village people into your regular customers, including the barber, fruit shop owner, magician and flower shop lady! Interesting stories related to your unique regular customers. Accumulate your affinity point to receive special presents from your customers! Buy and sell items with other users through the trading board and catalog! Manage your café and village more efficiently by helping each other. Participate in new events every week and get pretty items. You can also take on the challenge to become the top of the rank.